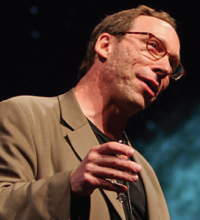 The Psychology Department of the University of Otago is sponsoring two talks by leading physicist Professor Lawrence Krauss next week. If you’re in town, be there! Among his popular science books are Hiding in the Mirror (2005) and The Physics of Star Trek (1995). Hiding in the Mirror is subtitled: The Quest for Alternate Realities, from Plato to String Theory (by way of Alice in Wonderland, Einstein, and The Twilight Zone), which will give readers a better idea of what it’s about! Don’t be mislead by this to thinking he is a lightweight populist, he’s a serious physicist who has received many awards. According to wikipedia and his on-line biography he is ’the only physicist ever to have been awarded the highest awards of all three major US Physics Societies’. He is also a recognised science publicist, with his awards noting this in alongside his physics contributions. With the credentials he has in science communication, I have no doubt that he will be an excellent speaker. The distinction between science and fiction and between sense and nonsense has become blurred in popular discourse, most recently manifesting itself around the teaching of intelligent design in public schools. In this lecture Professor Krauss will use examples from government and the media to explore what science is, and what it is not. The lecture will be part ’tour’ through the fascinating world of modern science, part fun-filled examination of video clips, and part sober discussion of the various dangers facing modern society if we fail to learn the lessons science has taught us about the world. We are all star children. Every atom in our bodies was likely, at least once and probably many times, to have been inside the fiery inferno of an exploding star. In this lecture Professor Krauss will trace the biography of a single atom — one that will be in a glass of water sitting on the stage at the beginning of the lecture — from the beginning of the Universe, before atoms themselves existed, until the end, as we currently envisage it. Its story will also lead us to confront some of the most exciting new discoveries as well as the greatest outstanding puzzles in physics, cosmology, geology, and biology, as well as some lessons about our own place in the Universe. HT: Thanks to Genetics Otago for bringing this to my attention. The inheritance of face recognition, so should you blame your parents if you can’t recognise faces? I just read this email too, can’t wait! I will be there to listen to this interesting lecture. We don’t get any good concerts or sporting fixtures in Dunedin but we can at least get some good talks thanks to the University. Good to hear youâ€™ll be going to the talk. I put this up in the hope that it might attract a few people from outside the university. I think sometimes the public talks offered by the university don’t reach the general public as well as they might. For anyone wishing to attend the second talk, on tomorrow night, I suggest arriving a little ahead of time to ensure you get a seat.